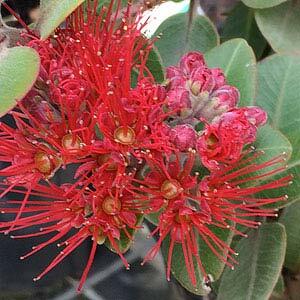 With wonderful red bottlebrush like flowers the New Zealand Christmas bush or pohutukawa is Metrosideros excelsa. A number of cultivars are offered by wholesale growers, including ‘crimson glory’ which is smaller than the species. Metrosideros are mostly evergreen, with most species having flowers ranging from pink and yellow through to red. Many make good hedging plants and even the larger growing species can easily be pruned back to form a hedge with attractive foliage. The newly released cultivar ‘Firecracker’ has variegated foliage and makes a useful alternative where foliage color variety is required. Me. kermadecensis which grows to approximately 15m to climbers and small shrubs such as the cultivar M. Fiji Fire which will grow to around 3m. M. ‘Tahiti’ is a recently released dwarf form that can be grown in containers.